In 2018 the general public is taking Stanning to a new level. If you’re been living under a rock, if you Stan for something it simply means that you like something, a lot. According to Urban Dictionary, a Stan is defined as an overzealous maniacal fan for any celebrity or athlete. The actual term Stan stems from Eminem’s 2002 hit, Stan. You can Stan for a celebrity by tattooing their face or lyrics on your body, by attending multiple of their concerts while on tour, sending them fan mail or buying all of their products to proclaim your Stan loyalty. Another one of our favorite ways to Stan for your favorite celebrity? With bomb nail art, of course! Some Stans will only do an accent nail when commemorating their favorite celebrity artist. Others will go out with a full blown nail set with individual nails representing something from their favorite celeb’s newest album. 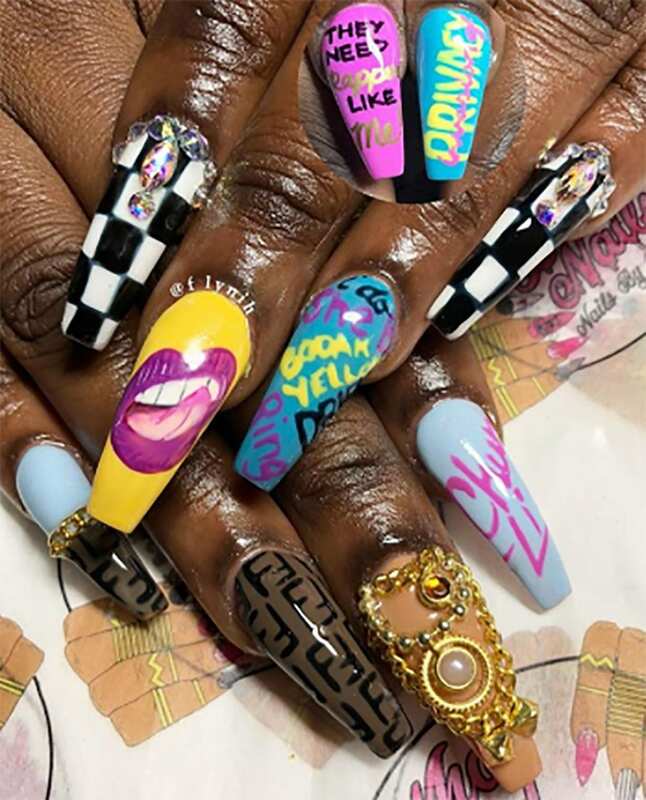 If you’re looking for inspiration for your next set of Beyonce, Cardi B, Nicki Minaj or Rihanna inspired nails – look no further, we’ve got you covered! We wanted to round up our favorite nail art moments from the biggest Stans out there! Beyonce is one of our all-time favorite artists. Her ‘Stans’ call themselves the BeyHive and they’re loyal AF. The bee is the symbol that Beyonce associates herself with the most, as well as the lemon from her latest solo album, Lemonade. Below are our favorite Beyonce inspired nails found on Instagram! Cardi B is one of our favorite new artists. She popped onto the scene in late 2017 with her single Bodak Yellow and has been extremely successful since! Her fans are die-hard and flaunt their style on Instagram like no other! They’re sassy, just like Cardi and always bring a strong nail game. So I missed out the Nail Competition but I ain’t miss out the fun #drippininfinesse #cardib #cardibnails #naillove @iamcardib @jennys_spa_bx you inspired me???????????????????????????????????? @everything_nail_art and @_swarov thanks Hun for the beautiful ???? We couldn’t make this list without including the queen of rap (and Cardi’s arch-nemesis) Nicki Minaj. Nicki has been killing the nail game since she came onto the scene – always rocking fierce AF nails. Nicki’s Stans are called Barbies or The Barbz for short. ???? HOW DID I DO ?! LETS LOVE BOTH @nickiminaj & @iamcardib ???? . My client suggested this and i gave it a shot ! I’ve been seeing so many inspired nails by Chun Li & Invasion of Privacy cover art so let’s combine them ! Happy birthday ! ???? it was such a pleasure ! ???????????? @trecedabeast is about that nail life ! #nihyadoesmynails #whodidyournails #lit #gwinnettnailtech #atlantanailtech #nailtech #nailartist #glowinthedarknails #dopenails #ombrenails #undiscoverednailtech #cardib #cardibnails #nickiminaj #nickiminajnails #chunli #invasionofprivacy ❤️✨???????????????????? Last week we featured our favorite nail designs by Rihanna. This week we are highlighting our favorite Rihanna inspired nail art designs. Rihanna herself uses the term Stans when referring to her fans, paying homage to her friend, Eminem. Another shot of my Rihanna inspired nails, ooh girrl. Which style is your favorite? Leave us a comment below!